Although they're both delicious on their own, avocados and coffee together don't really sound like a winning combination. So, why would a coffeemaker name itself Three Avocados? Simple: a mission group visiting Uganda in 2010 attended a church ceremony in an impoverished village, where they witnessed a widow place three avocados -- everything she had -- into a collection plate to help feed the church's pastor. That experience spurred them into action, forming a non-profit organization paying local workers fair wages to produce rich, earthy coffee and use the proceeds to bring clean water to the region. 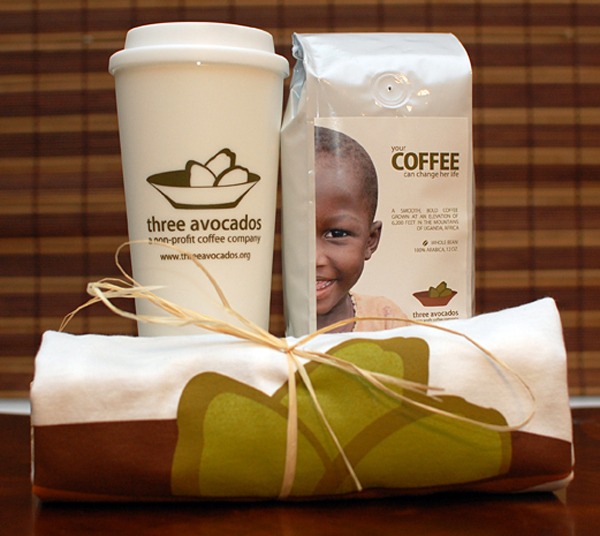 Three Avocados now offers single-origin whole bean and ground coffee ($12 per package) from Uganda, which neighbors Kenya and Ethiopia, both world-renowned for the coffee they produce. 100 percent of the net profits are used to provide clean water to the locals, allowing young girls to attend school instead of spending their days walking miles and miles to bring water home to their families. For them, Three Avocados means meaningful work, fresh water and better health. For you, it means a delicious cup of joe that does considerable good in the world with every sip. So, coffee lovers: if the caffeine alone isn't enough of a jolt to get you going, the effect you're having on the lives of the people who produced it should be strong enough to put a spring in your step. Bottoms up!